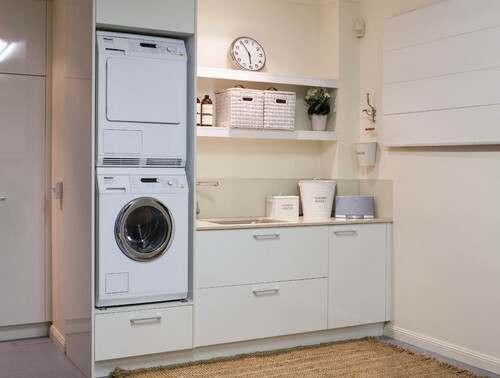 So you may be in the market for a new compact washer and dryer to fit in a limited space but you may not know where to start looking or what will even work for you. The problem that some folks run into with compact laundry is that different models will have different electrical requirements. For example, there are no compact dryers available in gas. They are all electric. Some require separate outlets and some require just one outlet. It may seem a bit daunting, but we are going make it easy as possible to understand in this article so you can find what will work for you. 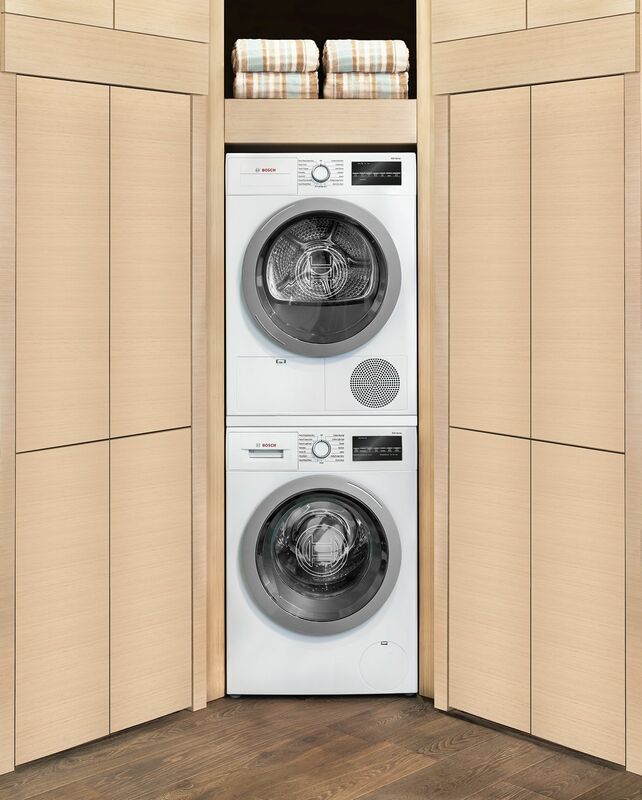 Compact laundry is popular in the industry because it can fit anywhere. You can install it in a closet, a bathroom, or even in your kitchen. Most compact dryers are non-vented meaning you can install it anywhere as long as you have water and electricity available to that area. Compact laundry is usually 24" wide, 34" tall, and about 23"-25" deep compared to a full-size unit, which can be 27" wide, 39" tall, and 32" deep on average. Some of the well-known brands that offer compact laundry are Bosch, Miele, Electrolux, Asko, Whirlpool, LG, and Blomberg. Asko and Blomberg would be the only 2 compact units available that can be vented to the outside. They do have ventless dryers, as well. All other dryers are non-vented and use condensation or a heat pump for drying. Heat pump dryers use a compressor instead of heated elements to dry your clothes. What this means is that air is first heated, then passed through the drum of your dryer. The hot air absorbs moisture from your clothes and goes through the evaporator as moist air. The evaporator removes that moisture to be collected as condensation in a tank. The now dried air is recirculated to continue the process. Heat pump dryers are inexpensive to operate and use half the energy of other dryers. Depending on your energy costs, you could save up to $100 a year. Not to mention, for Massachusett residents, there will never be a problem with Make-Up air in a heat pump unit. 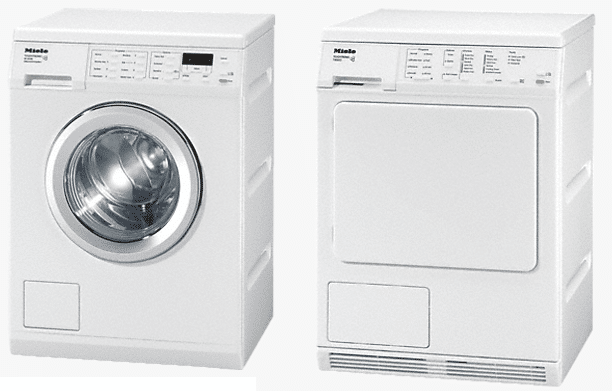 Now, let's introduce some of the more popular models of compact laundry and their electrical requirements. 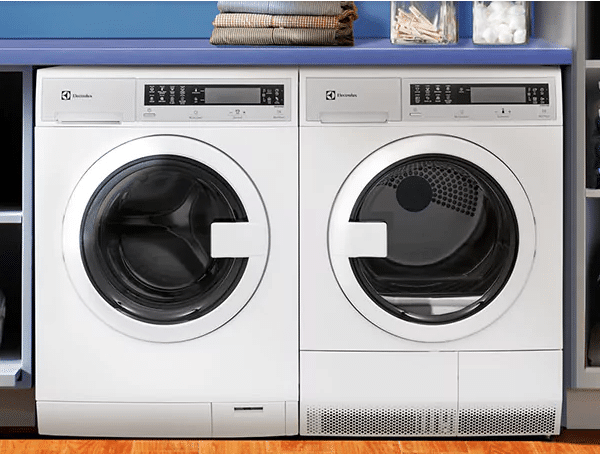 What are the Electrical Requirements for Compact Laundry? Blomberg is popular, especially as an inexpensive vented solution. The washer plugs into the dryer and requires a 30-amp circuit or electrical feed from your main panel. In simplest terms, the circuit is a system that is the whole electrical line and outlet (where you plug into). Electrolux has one of the biggest capacities for a compact washer which is 2.4 cu. ft. The washer also has a steam feature which makes it easier for stain removal. This compact Electrolux set requires 2 separate electrical outlets and 40 total amps. Electrolux is non-vented only. Bosch is incredibly reliable. The washer has a unique power cord attached to it which plugs into the Bosch dryer. You will need a 30 amp circuit. 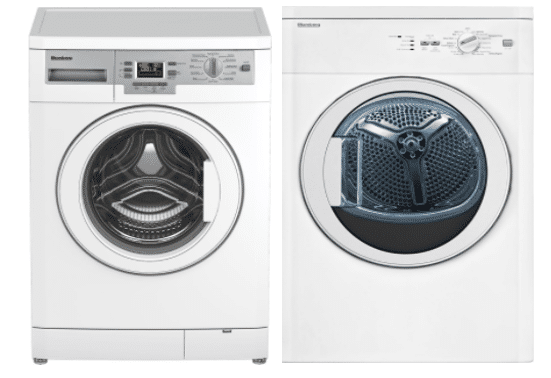 Miele is the most reliable for compact laundry. However, it's expensive. You would need two outlets and 40 amps for the Miele. What is the easiest to install? Condensation dryers are easier to install than vented dryers because you do not have to run a vent to the outside. In many cases, venting a dryer is impossible inside closets or kitchens. From an electrical standpoint and ease of installation, the Blomberg heat pump can be installed into a 20-amp outlet with only one electric line. Bosch would be the next easiest with one outlet at 30 amps. Miele and Electrolux need two outlets for both your dryer and washer to plug into, and 40 amps. Our most important piece of advice is to always check what kind of circuits your building or home has and how much amperage you can draw in order for your machine to work correctly. If you live in a condo, apartment complex, or older building, check with your property manager. Download the Yale Compact Laundry Buying Guide with specs, features and inside buying tips to every major brand. Well over 200,000 people have read a Yale Guide.